Meanwhile, let's ogle this pretty box Elizabeth made for an issue of Crafts Beautiful magazine last year. The medallion is an example of tea bag folding, something we don't see too often in the U.S. Funny name, right? Don't worry, no tea leaves are harmed in the process. Elizabeth, how did you happen to get started with paper crafting, and especially quilling? Quilling is the paper craft I began with about twelve years ago. It started me off on my creative career and it is the craft I continue to return to. I began making cards around 1998 when I was working full-time in Cambridge [England] for a software company. I needed something creative to do at weekends, so I bought my first quilling set in 1999, and this set me off on the quilling road! How did you decide to start selling your designs? I was getting really nice comments from friends and family which encouraged me to have a stall at a craft fair. So in the year 2000 I had a stall and sold my cards which all sold on the first day, so I had nothing to sell on the second day! It was brilliant, but exhausting. Have you studied art formally? Yes, in 2001 I decided to leave my job and study on the one year Art Foundation course at Norwich School of Art and Design. I gave myself one year to see if this art and craft life was for me, and if I could make a go of it. You do quite a bit of designing for magazines in England... how did that come about? It was at another craft fair in 2002 that a magazine editor asked me to write an article for the magazine, Crafts Beautiful. I then decided to stay in Norwich for another three years and study for a fine art degree specialising in printmaking. The publishers, David & Charles, (part of the F&W group) saw my work in the magazine and commissioned me to write my first book. This was a busy time as I had a degree to study, two part-time jobs, and writing my first book, The Papercrafter’s Bible! Three more books followed before I could be fully self-employed as a craft designer. Your David and Charles books are well-regarded. 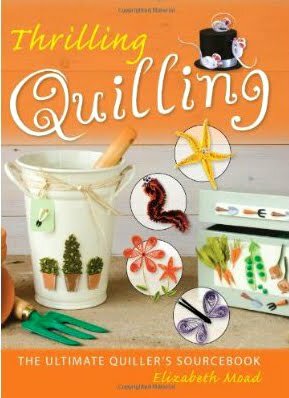 How did you decide to take on the task of self-publishing this time around for Christmas Quilling? Unfortunately the recession hit us here in the UK and I was not commissioned for any more books, so I woke up one morning and decided I would do it all myself. I called the photographer and editor who worked on my previous books to request their help, called printing firms for quotes, and then found a designer friend to do the layout of the pages. It must have been empowering, but a tremendous amount of work at the same time. Yes, I was left with designing and making the cards, writing the instructions, preparing the steps for photography, planning the layout of the book, and of course funding the whole project. However, having complete control has been really exciting. Styling the cards for the photography was great fun – putting the Christmas props around the card to get the shot right, took at least thirty minutes for each of the main project cards. Finally, I took it to a local printing firm in the very English village of Lavenham. They let me go in to see it come off the press which was fabulous. Now I have a wall of boxes of my books stacked up in my house, and I am learning a lot about distribution and selling on Amazon. Still another book is being planned in my head so it can’t be all bad! Here are a few pictures of Christmas Quilling rolling off the press. Elizabeth says it took two hours to print the pages as the litho presses run off 15,000 sheets per hour. The books were bound and stitched in another process. Wait a second... I think I spy a pair of knees hiding back there. Camera shy perhaps, or a part of the printing process?! This is a tea bag folding card Elizabeth made to go along with the box. It shows a classic rosette of eight folded squares, except that on this card and the box, Elizabeth folded two different sizes as a twist. She often cautions people about buying tea bag folding books, because many include origami type diagrams that are difficult to follow unless you're a pro. Elizabeth says she learned by trial, error, and a lot of folded pieces! I love hearing about how people started something as more or less a hobby and turned it into a full blown business. I love her tea bag box. I discovered that a few years ago and really enjoyed doing the fold but found some to be a little frustrating.. It's great to hear more about Elizabeth as her work is so inspiring. Thanks! Nice interview- it's always interesting to hear how people got started with something like quilling and paper crafting. In a former life, I worked on the production end for many beautiful 4/c books. To see Ms. Moad take charge and do all the work herself is truly inspiring. And there's nothing like overseeing the printing of your own book. Now talk about fulfillment! I wish her the best of luck. She's quite an amazing person. Great interview.. love hearing how people start out.. that must have been a thrill and a half to watch your book being printed..
Love the box and the teabag folding as well..
Really enjoyed the interview, I know she has many more books coming ,I wish her the very best.